When Danny Welbeck hurt his ankle playing for Arsenal, the Press were quick to brand it a “horror injury“. Welbeck was in pain. That much was clear. But it wasn’t look-away horrific. And we don’t yet know how bad the injury is. It wasn’t like when Welbeck’s Arsenal team-mate Aaron Ramsey had his tibia and fibula broken at Stoke City, or when Eduardo had his leg badly broken when playing for Arsenal at Birmingham City. Eduardo’s injury was so nasty that Sky Sports decided against showing replays of it. Educardo’s bone ended up poking though his sock. And Can we talk about David Busst? On April 8, 1996, Busst was playing for Coventry City at Old Trafford to take on English football giants Manchester United. After two minutes of the match played, Busst had suffered compound fractures to the tibia and fibula of his right leg. He never played professional football again. 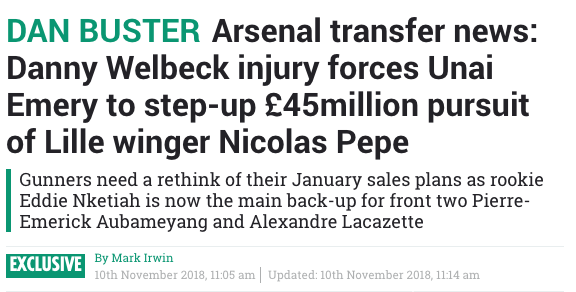 As the papers guess, and anyone sane wishes Welbeck a speedier recovery than the ghouls do, the Sun says Arsenal are already looking for his replacement. So how do you replace a man valued at £10m and in the final year of his contract – a player whose not been offered a new deal and was likely to be sold in January to Crystal Palace? 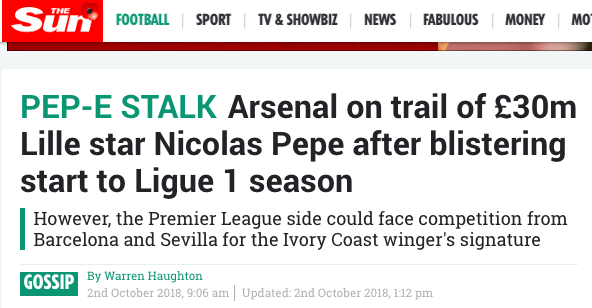 They say Emery could now make a £45m bid for Lille’s Pepe in January. DAN BUSTER Arsenal transfer news: Danny Welbeck injury forces Unai Emery to step-up £45million pursuit of Lille winger Nicolas Pepe. Got that? The Gunners will splash out £45m on a new face because Danny Welbeck got injured. No full diagnosis has been made. The “England striker could also have suffered ligament damage” says the Sun. He could have. Or maybe he didn’t? As for Pepe, well, the Sun provides not a single fact to support the news that Arsenal want the Lille man. Arsenal “could” face competition for his signature form Barcelona and Sevilla, says the Sun. The Express says Bayern Munich want him. The Times says: “Manchester City bid for Lille’s Nicolas Pepe .” And the Manchester Evening News says, predictably, Manchester United are chasing Pepe. Meanwhile, the player is still at Little. And Welbeck hasn’t been despatched to the glue factory. Yet.